Unless your name is Iris Apfel, who at age 94 is considered the grand doyenne of fashion (the woman who put the “ista” in “fashionista”) I strongly suggest you sort through and cull your costume jewelry collection before you even think about where and how you’re going to store it. First things first, no matter what you think, you need to gather up every single piece of jewelry and spread everything out on a flat surface. Next, separate, untangle and categorize all of the trinkets into four separate categories – earrings, rings, bracelets and necklaces. Now it’s time to take a long, hard look at what you have and make some practical decisions, which, trust me, are about as difficult as trying to decide “white or dark meat” on Thanksgiving Day. If something is broken or missing a clasp and/or rhinestone, put it in a pile to be donated; if you no longer like something, or for that matter, never liked it in the first place, you can either donate or consign/sell it or just give it away. If you don’t have pierced ears, why hold onto heaps of pierce earrings and if you don’t like “hanging” hearings, why are you keeping them? Now that you’ve judiciously culled your collection and have narrowed down the “keep” pile, you’re almost ready to put everything away in an organized fashion. But, wait! There are two more questions to ask yourself before putting anything away, and they are: “Do I really love, love, love this piece and will I ever wear it?” If you answered, “yes” to both questions, keep it. Otherwise, you know the drill; consign, donate, sell or give away. There are lots of options for organizing your jewelry. 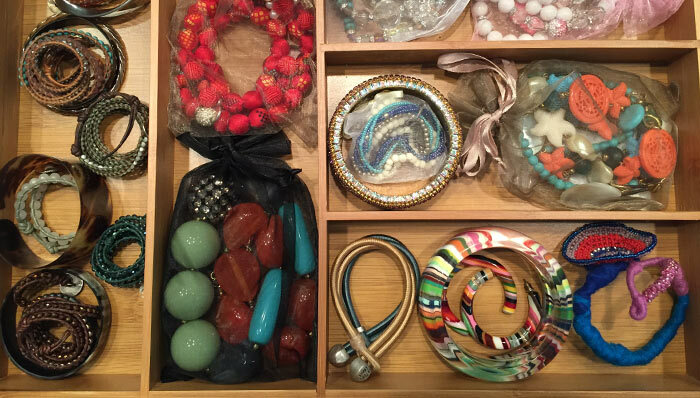 Personally, I prefer using expandable wood drawer organizers where you can neatly store oversized bangle bracelets and large necklaces, which I store in multi-colored, multi-sized organza bags in order to keep things from tangling and/or getting scratched. If you don’t like the idea of expandable drawer organizers, purchase velvet drawer organizers, the kind with lots of different sized spaces made specifically for rings, earrings, bracelets and necklaces. Either way – expandable wooden drawer organizer or velvet drawer organizer –putting things away in a drawer gives you a bird’s eye view of all your baubles, making it easier to find something when you need it. Another benefit of using drawer organizers is you can store your oversized bangles neatly without jamming your drawers. My other lifesaver is to use Command-brand Hooks, which I use in the inside of my medicine cabinet door for necklaces and dangling earrings. This under-utilized space is the perfect place to “hide” your jewelry in plain sight; and to top it off, your countertops will be clean and clutter-free. Finally, contrary to what some people might tell you, a fishing tackle box is NOT the best solution, nor is the clear plastic, multi-pocket jewelry organizers that hang on the back of your door. With these two methods, all you’re doing is adding to the clutter, not to mention the tangle of toggles. Put each necklace & bracelet on the clothes hanger with the outfit it goes with. Keep earrings on the card they came with, but use a hand-held paper punch to cut a couple of holes in the card and slip them on the hanger too. That should just leave you with rings to store. If you have any extra jewlery that doesn’t “belong” to an outfit, it just makes it easier to part with. Saves time getting ready too! What a great way to start the day! Thank you for taking the time to write and especially for your kind words and compliments.